Ticket to Ride is one of the top board games leading the way on the Android market. It is developed by Asmodee Digital, which has fetched a splendid rating of 4.3 out of 5 and more than 100 thousand installations since its most awaited inception on the Google Play Store. Ticket to Ride game does away with all the fiddly tedious parts of the board game and brings strategy on the front wheel. 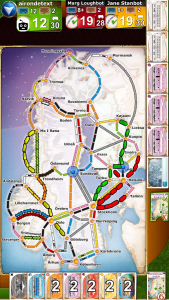 The objective of Ticket to Ride game for Android is to build a railroad system by claiming routes between cities. The interface of the app is average. Once after successful installation, the launch of the app begins with a tutorial to aid in navigation and understanding the controls and how to maneuver through the game play. The game provides scores for each route and the longer route yields more points and aids in the collection of adequate number of colored cards from the sideboard. It provides extra points for completing Tickets, lengthy, multi-city routes, and for having the longest continuous route on the board. Ticket to Ride game app is compatible with both smart phones and tablets. It requires Android version 2.3 or higher. The app costs $1.99 as one-time payment to experience all the features of the game without any hassle and warding off marketing advertisements forever. The app supports multiple languages including English, French and German. Ticket to Ride Android game app provides a platform to compete globally with leading players to prove one mettle in the arena of strategy. However, it also provides a solo play to compete against 4 AI players to hone the skills and do well with live opponents. There are seven additional maps and two mini expansions with three variants to experience a new arena every time you get into the arena. It has an unparalleled online player community with thousands of opponents to challenge and play the game in multi-player mode. The game has secured accolades from Pocket Gamer and Ars Technica and its contextual in-game notes aids in understanding the maps more effectively. Grab a free copy of the app from Play Store to build the rail empire and drive into one of best traditional board games of decade.